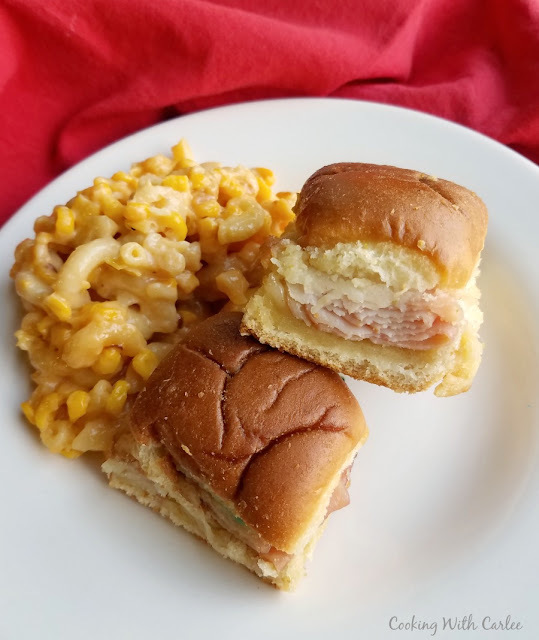 Toasty, melty, tasty sliders filled with ham, turkey and cheese are perfect for so many occasions. They are so easy to make and fun to eat! Melty cheese and golden toasty buns are the stuff slider dreams are made of. These tasty little hot turkey and ham sandwiches are perfect for a party or great for lunch. Have some people over to watch the game? Throw some sliders in the oven for the perfect game time snack! They are tasty, toasty and so easy to make too! Of course green egg and ham sliders were a must have entree for the Dr. Seuss themed birthday party. But I wasn't sure if some people might be a little squeamish about the green eggs. Besides, if sliders were going to be the focal point, I figured some of the bigger eaters might want some variety. So something simple and complimentary seemed in order. I love that you can prep sliders like these ahead of time and store them in the refrigerator until it's time to bake them off. So after making a triple batch of green egg and ham sliders, I whipped up a triple batch of these. Luckily a triple batch of sliders fits perfectly on a half sheet pan, and two half sheets fit in the oven together nicely. So the day of the party, I had an oven full of slider goodness! As I was putting these together, I was tempted to trick them out with something else to make them a little fancier. But every topping I could think of ran the risk of turning off some of those same people who might not like the green eggs. So I figured simple might be better. And you know what? Sometimes simple really is better. There isn't a whole lot to these, nothing groundbreaking or crazy. But the simplicity allows each flavor to really shine. The soft, slightly sweet bread with the golden buttery top. The gooey melted cheese and the slightly salty meat all come together to create something greater than the sum of the parts. The neighbor kid agreed. He worked up an appetite playing at our house the next day. So I warmed him one up. He gobbled it down and asked me what was on it so he could go home and see if his gram could whip him up one. Of course I went in and warmed him up another! All 72 sliders were gone the day after the party and that is really saying something given the amount of other food available! So next time you are looking for a super fun snack, a great lunch for a few people or a tailgate nosh, be sure to make a batch (or 3!) of these sandwiches! And let me know what your favorite slider combinations are in the comments! Grease a 9x13" pan. Cut the rolls across the equator and place the bottom halves in the pan. Spread mayo or sandwich spread over the rolls. 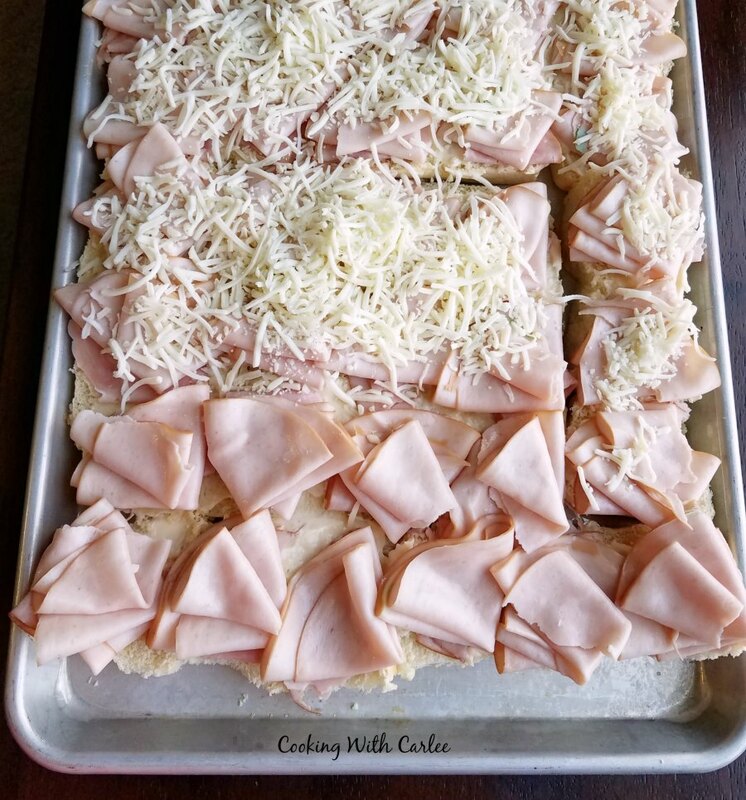 Layer with turkey and ham and then sprinkle with cheese. Cover with the top halves of the rolls. Melt the butter and stir in the mustard. 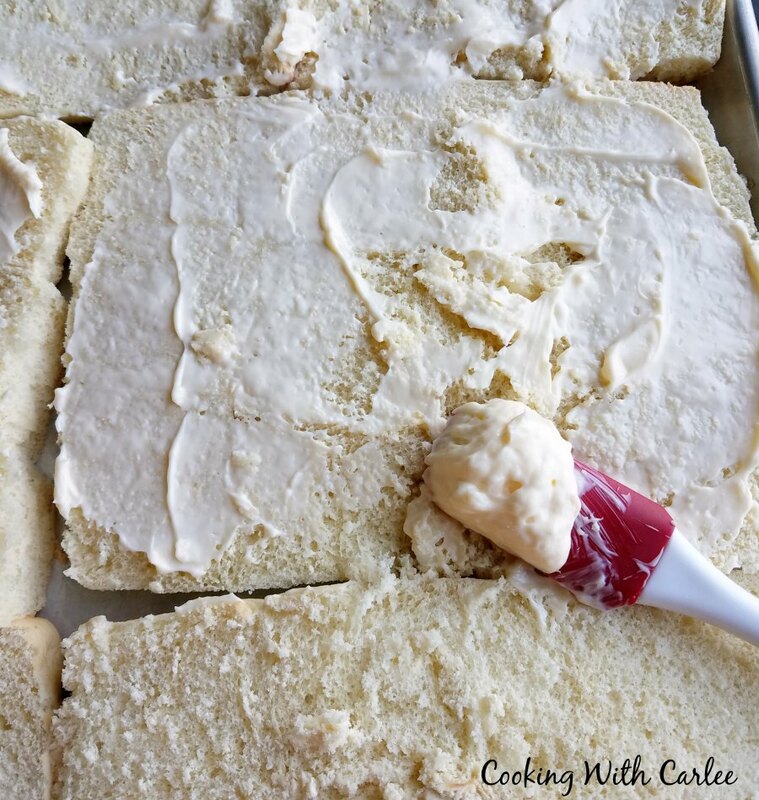 Brush over the tops of the rolls. Cover tightly with aluminum foil and bake for 20 minutes, then remove the foil and bake for about 5 more or until the cheese is melted and the tops of the rolls are lightly toasted. *Sliders can be prepped up to a day ahead and refrigerated until you're ready to bake them off. Perfect weekend or lunch meal to feed my boy crew!! They would love this! Happy Monday sweetness! I always need ideas for lunch when the kids are home for the summer. These will be perfect! I love these little sliders. Turkey, ham and cheese sounds fabulous. I really think that I needed to be at that birthday party! 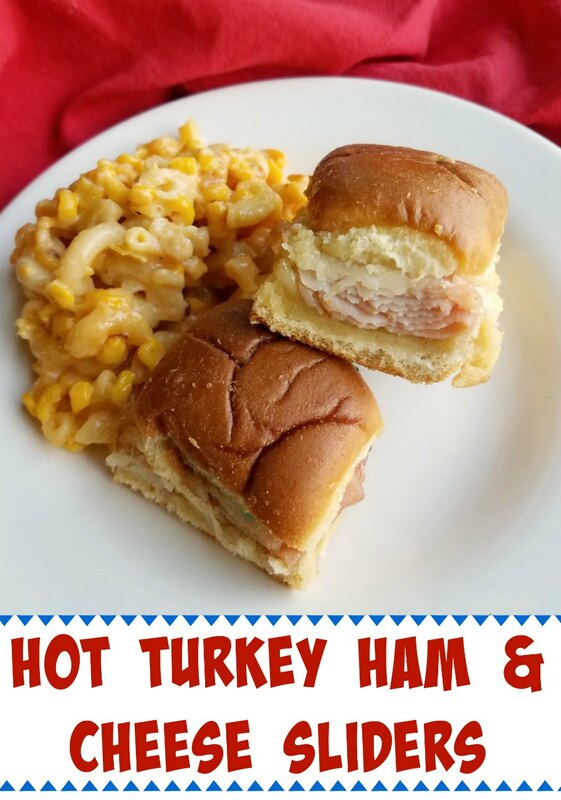 We will really enjoy y our Hot Turkey, Ham and Cheese Sliders, yum! Hope you are having a great weekend and thanks so much for sharing with us at Full Plate Thursday! We love this kind of fun food and don't make it often enough. That way they enjoy it even more when I do. This post is a Feature pick at Merry Monday this week for Summer Fun Food! Sharing. Hope you are having a wonderful Memorial Day. I love sliders! I think they are so yummy to feed a crowd. Your recipe looks and sounds divine!